We offer 6 - 60' x 60' turn outs and 3 grass paddocks. Turn out is included for every horse. 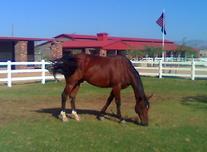 Lunging and monitored turn out (let your horse run and play) is available in the front sand arenas.